"SMS/Text-message can be a promising and accessible platform for self-screening for learning difficulties in low-income populations, yet is largely unexplored with people who have dyslexia." This is where ‘Dyscuss’ comes in. Dyscuss is an iOS and SMS-based intervention to assist with understanding and identifying the symptoms of Dyslexia aimed at middle-income and lower-income populations in urban and rural India respectively. These populations include teachers and parents of children, ages 6 and above who may display signs and symptoms of dyslexia. The application will be able to identify whether the user requires further formal testing by a qualified educational psychologist through a series of questions to which the user may respond to in the format of a conversation. 1. “Dyslexia Screener for School-Age Children.” International Dyslexia Association. Accessed April 16, 2016. https://dyslexiaida.org/screening-for-dyslexia/dyslexia-screener-for-school-age-children/. 2. “Dyslexia Screener for Preschoolers.” International Dyslexia Association. Accessed April 16, 2016. https://dyslexiaida.org/screening-for-dyslexia/dyslexia-screener-for-preschoolers/. 3. “Diabetes Text-Message Self-Management Support Program (SMS4BG).” National Center for Biotechnology Information. March 25, 2015. Accessed April 16, 2016. doi:10.2196/ mhealth.3988. Hospital Discharge in a Largely African- American Population.” National Center for Biotechnology Information. March 11, 2013. Accessed April 16, 2016. doi:10.2196/jmir.2317. 1. Dyslexia International. Dyslexia International - Report Final. PDF. April 29, 2014. 2. Alabama State Board of Education. Dyslexia Resource Guide. PDF. Alabama State Board of Education, January 7, 2016. 3. Tech Tools for Students with Dyslexia & Struggling Readers. PDF. November 12, 2015. 1. Davis, Ronald D., and Eldon M. Braun. The Gift of Dyslexia: Why Some of the Smartest People Can’t Read and How They Can Learn. New York: Berkley Pub. Group, 1997. 2. Nuttall, James R., and Linda M. Nuttall. Dyslexia and the IPad: Overcoming Dyslexia with Technology. United States: James Nuttall and Linda Nuttall, 2013. 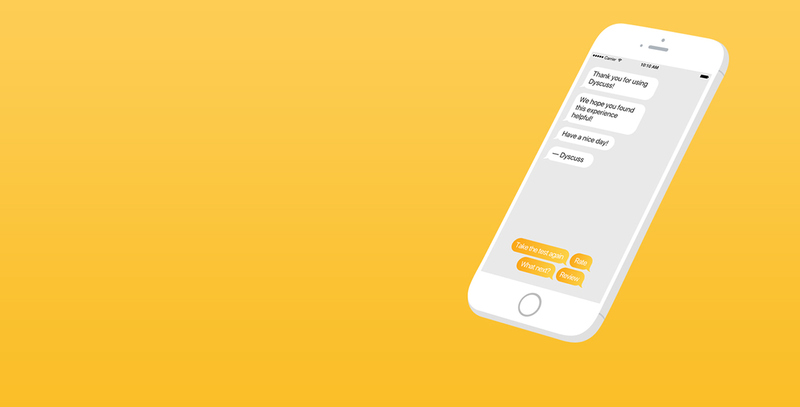 Dyscuss is an iOS and SMS-based intervention to assist with understanding and identifying the symptoms of Dyslexia aimed at middle-income and lower-income populations in urban and rural India respectively.